DBCC CLONEDATABASE is a new DBCC command introduced in SQL Server 2014 SP 2 which is used for creating the clone of a specified user database which helps in troubleshooting the performance issues related to the query optimizer. When a clone of the database is created using DBCC CLONEDATABASE, it will create a schema and statistics only copy of the specified database and does not contain any copy of the data. Creating the clone is as simple as passing the source database name and clone database name to the DBCC command. Once the cloning is completed, the cloned database will be in Read-Only mode. So what actually happens when we issue the DBCC CLONEDATABASE command on a database? It will start with few validations before the clone is created, The following validations are performed by DBCC CLONEDATABASE. The command fails if any of the validations fail. The source database must be a user database. Cloning of system databases (master, model, msdb, tempdb, distribution database etc.) isn't allowed. A database that uses the same name as the clone database must not already exist. The command isn't in a user transaction. The destination database files will inherit the size and growth settings from the model database and the file names of the destination database will follow the source_file_name _underscore_random_number convention. Using the below command, we can check if a database is a clone or a normal database. The testing has been done in such a way that all of its features can be evaluated to determine the SQL backup recovery tool on the basis of quality, reliability, performance, security etc. The following section is focused to provide a transparent review of the tool on the basis of expert’s experience. 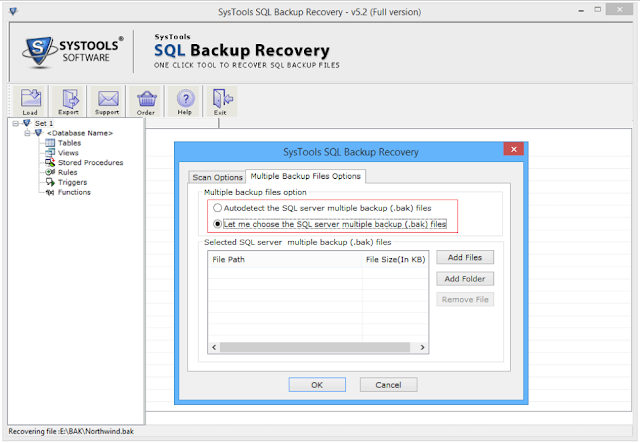 The tool facilitates the recovery of all MDF and NDF files from the corrupted backup file i.e., various database components such as tables, views, functions, triggers, keys, indexes get recovered from the chosen backup file. The user can perform scanning in any of the mode, depending on file corruption extent. 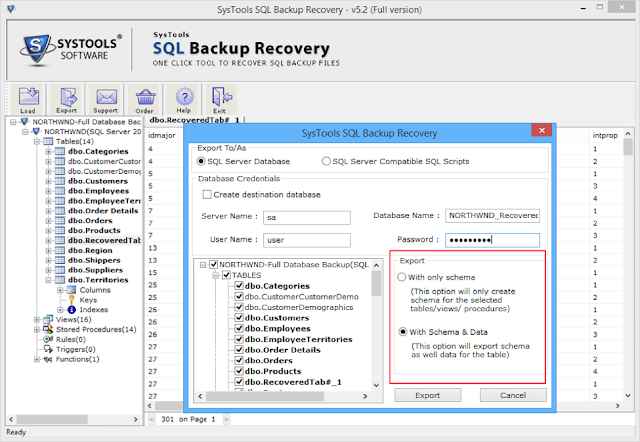 SQL backup recovery tool provides Multiple Backup File Options to let the user add multiple backup files or folder for data recovery. So if user faces an issue where multiple backup files got corrupted, this multiple backup option can be chosen to recover all data. 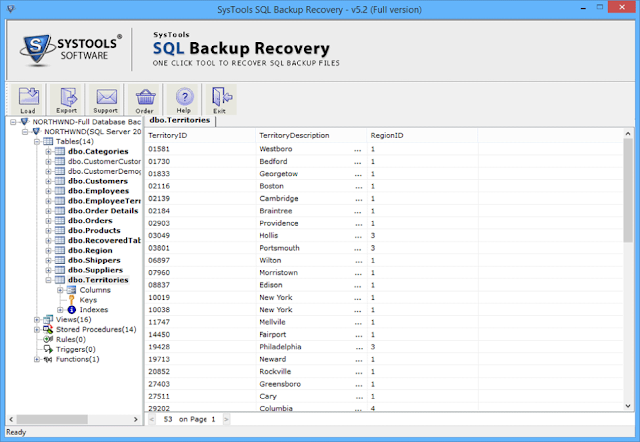 Once the complete backup file is scanned, the tool provides preview of all repaired database components. The user can choose to preview all database component like tables, views, triggers, columns, functions, keys etc. The tool allows the user to export selected database components from the scanned data. The user can make selective choice to transport the required database objects from the backup file. Export To SQL Server Database - It allows to export selected repaired data directly into SQL Server by providing database credentials. Export as SQL Server Compatible Script - It generates SQL script, which is compatible for any SQL Server version. Along with the data recovery, the tool also helps to recover both primary and foreign keys of all the tables. So, we can say that the tool ensures to maintain data integrity of the data recovered from the backup file. In addition to above discussed features, the tool offers some additional features like auto-detection of SQL Server, no database size restriction, interactive user interface etc. Processor Requirement - Minimum 1 GHz is mandatory for tool installation. The experts suggest to use 2.4 GHz processor for faster processing. Mounted RAM - 512MB should be allocated at minimum. For larger storage, 1 GB can be used depending on requirement. Demo Version - Users can download the free version from company’s official website. It offers scan and preview of the backup files. 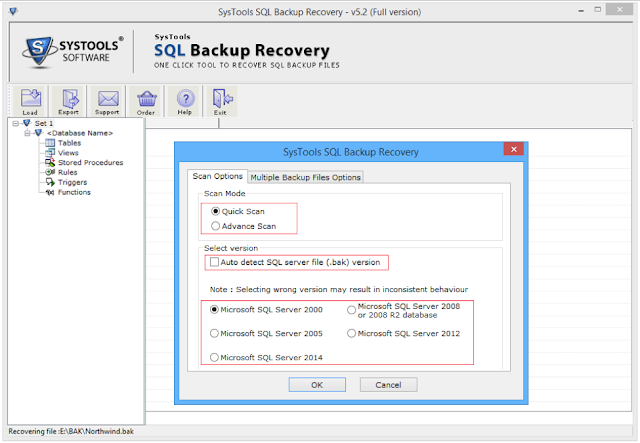 The tool provides recovery of backup files even without SQL Server installation on the system. The tool offers the recovery of highly corrupted backup files using advance scan. The generated scanned files cannot be saved on the local system, which creates need for rescanning in future use. After working on various aspects of the software, we can conclude that SQL Backup Recovery tool fulfils all the expectations to repair damaged SQL backup file. The users can go for this tool for an efficient bak file recovery within few easy steps. 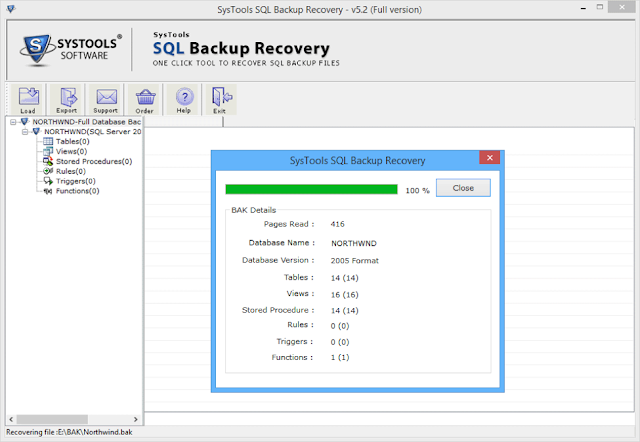 The tool can be rated as 9.8 on the scale of 10 as it provides an excellent approach to repair the corrupted or damaged backup files using its interactive user interface. Daniel Jones is a SQL Server DBA and contributor at SQL Tech Tips. Having 2 + years of experience in SQL recovery and system infrastructure.